I have to admit that I am not the soufflé maker in our household. Rather, it is my husband, Jérôme, who is the master soufflé chef. 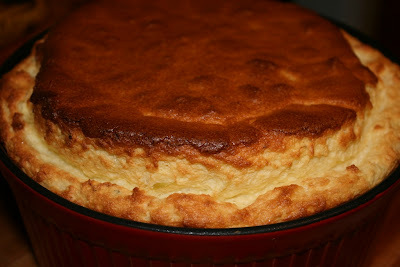 In fact, so much so that he received a wonderful soufflé dish from our friends Brandi and Gilles for his 40th birthday. Which he raced home and made a soufflé in the very next day. Although Logan is turning into a master eater - he ate lasagna for dinner tonight and even asked for more!!! - there was a looooooooong period during which soufflé was one of the only foods he would eat. Alternately with mom's mac and cheese. Plus a few random things, like yogurt and crackers. So Jérôme was making soufflés constantly for awhile there. We tended to make them with cauliflower because Logan couldn't tell there were vegetables hidden in there. But we also occasionally made a broccoli or zucchini soufflé instead (see bottom of post). To simplify my life, I would steam the entire head of cauliflower or broccoli at once and freeze it in Ziploc bags in little soufflé-like portions. This way, we could whip up a soufflé at a moment's notice when we had nothing left for Logan to eat. The vegetables need to be really well cooked for this recipe so that they will mash well and blend smoothly into the texture of the soufflé. So you want to steam them well beyond how you would normally cook them if you were just going to eat them with dinner. To save time, I steam them in the microwave, by placing cut pieces of cauliflower into a bowl with a bit of water and covering the bowl with a plate. I then just keep checking the vegetables until they are super soft. Then mash them as much as possible with a fork or potato masher. Sadly, there is no soufflé eating going on in our household these days, now that we are gluten- and dairy-free. Though I'm thinking that I may have to try to dream up a recipe that meets these criteria for Chloé, as she's getting to an age where she's old enough to start (hopefully!) enjoying these kinds of things. Soufflés sound really tricky. People are terrified to make them. But they're actually not as difficult as they seem. You just need to beat the egg whites really well and be super gentle folding them into the other ingredients (no whipping!). Another trick for success is to not prepare this in advance. 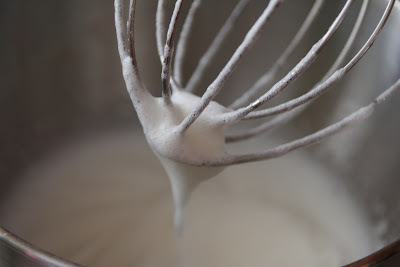 The egg whites will begin to fall and your soufflé will not be a success. Steps 3 and on need to be done just prior to putting this in the oven. 1. 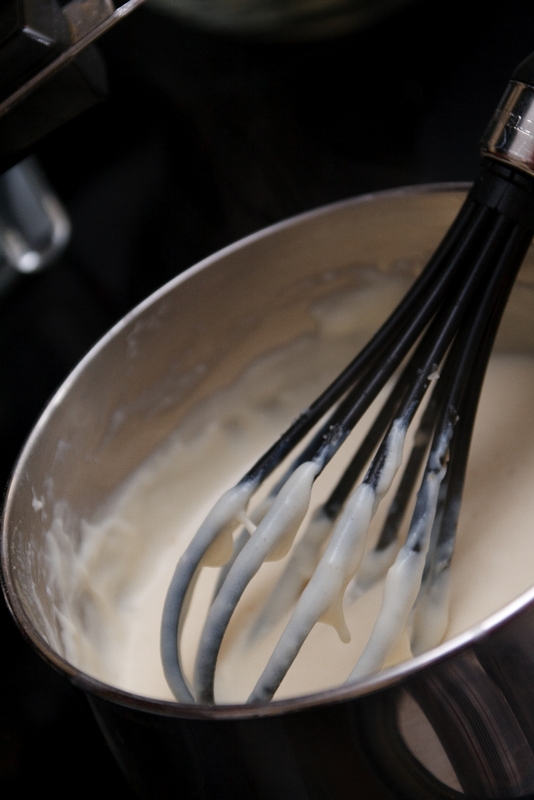 Prepare a béchamel sauce, following the instructions in this post here. Season with salt and pepper, to taste. 2. 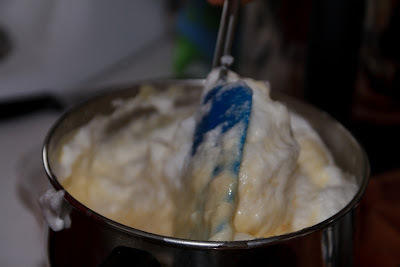 Mix the steamed, mashed cauliflower and grated cheese into the béchamel sauce. 4. Mix the egg yolks into the béchamel sauce, one by one, being sure they are well incorporated. 5. Using a spatula, gently fold the egg whites into the béchamel. This is what makes the soufflé rise. If you are impatient and just stir everything together, you will not end up with a soufflé. This is exactly why Jérôme is our soufflé maker around here - he has much more patience than I do! 6. Butter a soufflé dish. 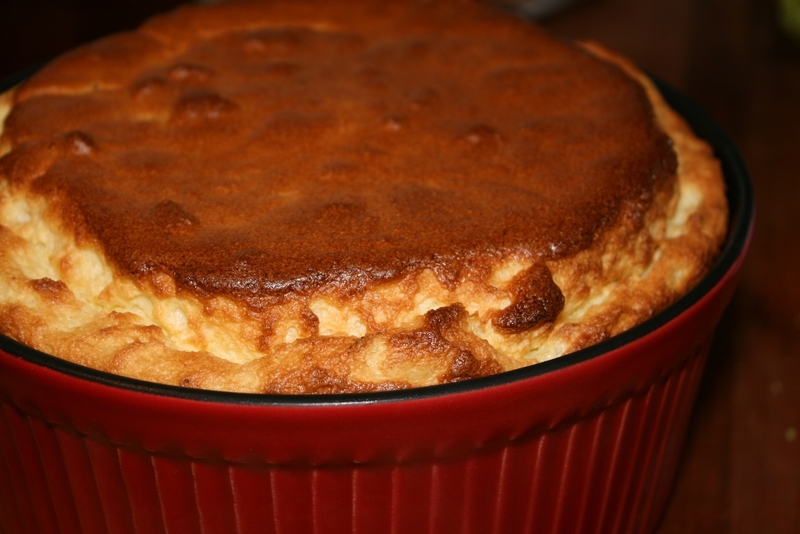 If you don't have a specific soufflé dish, any deep, round, relatively non-stick dish will do. Buttering the dish well is extremely important, as the soufflé needs to be able to slide its way up the side of the dish as it rises. 8. Serve immediately upon taking out of the oven. Even a successful soufflé will fall once it is taken out of the oven. If you have company over, you want to have everyone sitting at the table before you've even taken this out of the oven. Enjoy :) This goes super well with a spinach salad or with Brandi's salad. Come on I've been married a french chef for 10 years and nothing like that happen!!! !